Aurora: The cruiser that sparked a revolution – or did it? November 7 marks the 97th anniversary of the Russian Revolution. Visitors to St. Petersburg keen to see the famous ship that fired the shot that supposedly began the revolution will be disappointed, however – the cruiser Aurora was towed out of the city in September to be overhauled. RBTH looks back at the history of the ship and its role in the legend of 1917. For decades, the cruiser Aurora has stood by Petrogradskaya Embankment in central St. Petersburg. A visit to the legend of the Russian fleet was an important part of any tourist itinerary, and during the Soviet period the ship held an almost religious standing as the most important symbol of the Bolshevik Revolution. However, visitors to the city today are in for a surprise: The cruiser’s mooring now stands empty. "But where is the ship?" tourists ask in bafflement. The answer is that it is no longer in the city at all: On September 2014, the ship sailed out of St. Petersburg to be overhauled at a dock in Kronstadt (a naval base on an island in the Gulf of Finland), where it is undergoing planned maintenance. The Aurora was built almost 120 years ago. According to tradition, in Russia large ships were named by the tsar. Out of the names that were suggested - Varyag, Bogatyr, Boyarin, Polkan, Neptune - Nicholas II chose a female name. Aurora was the name of the Goddess of Dawn in Roman mythology. Surprisingly, the first to inflict damage on the cruiser were Russian forces, who attacked the ship as it was departing for the East in order to attack the Japanese Fleet during the Russo-Japanese War of 1904-1905. A Russian squadron mistook the Aurora's silhouette for an enemy ship and decided to open fire, wounding two people - one of them, a chaplain - fatally. Soon after, the crew were joined by two new passengers. On the way to Japan, at one of the African ports, the sailors took aboard two crocodiles. Later, the ship's doctor wrote in his memoirs how frightening it was sleeping on the cruiser: "We had to live with crocodiles, boa constrictors, lemurs, turtles and chameleons." One of the crocodiles, it seems, not wishing to participate in the upcoming war, preferred to jump overboard and die. The second one chose a heroic death: It perished during the Battle of Tsushima on May 27–28, 1905. Incidentally, the Aurora was one of only four Russian ships that escaped being sunk, captured or disarmed in the shattering - for Russia - clash. A false symbol of the Revolution? The Aurora is considered the principal symbol of the 1917 Revolution. According to the popular account of the uprising, the cruiser fired a blank shot signaling the revolutionaries to storm the Winter Palace, the seat of the Provisional Government, which the Bolsheviks intended to overthrow. Igor Kudrin, president of the St. Petersburg Submariners’ Club and advisor to the St. Petersburg governor on the issue of the Aurora, is preparing a book on the updated history of the cruiser. Kudrin considers the following events to be authentic: On the eve of the Revolution the cruiser was undergoing maintenance; the Bolsheviks ordered the Aurora’s crew to close the bascule Nikolayevsky Bridge, which had been drawn by military cadets loyal to the Provisional Government; the Aurora carried out its assignment and dropped anchor not far from the bridge. At 21:45 the ship then fired the actual shot. Yet for Kudrin, the fact that the storming of the Winter Palace did not begin until midnight casts doubt on the official version of events. "It doesn’t happen like that: The signal is made but the soldiers run to execute the command only two hours later," he says. A second version, according to an article that appeared in the Pravda newspaper on Oct. 29, 1917, says that the Aurora's sailors were protesting because of unverified accusations. "The newspaper writes that the Aurora opened fire on the Winter Palace," continues Kudrin. "But do the honorable reporters know that a shot from the Aurora would have taken down not only the Winter Palace, but all the streets around it? There was only one blank shot fired from a six-inch gun signaling for all the vessels on the Neva to be on the alert." Ten years later, thanks to a momentous event, the Aurora decisively became a symbol of the revolution. In 1927 the Communist Party management commissioned directors Sergei Einstein and Grigori Alexandrov to shoot the film October. Since the directors needed a vivid cinematic story, they decided to include the Aurora, which again, as it had ten years earlier, positioned itself on the Neva and fired a blank shot towards the Winter Palace. The film was edited in such a way as to make the naïve viewer believe that the footage was documentary and that the mass of people stormed the palace right after the shot. Thus, not only in the Soviet Union, but also around the world (the film was viewed worldwide), a legend was born that the shot began a new era in the history of mankind. During WWII the Aurora was anchored in Oranienbaum (a distant suburb of St. Petersburg). In 1941 it was seriously damaged by German air raids and ran aground. Caught in that position until the Siege of Leningrad had been lifted, the cruiser was continuously damaged by artillery fire. Even when the crew and weapons were removed from the vessel, the Aurora did not lower its flag, which infuriated the Nazis and simultaneously inspired the defenders of Leningrad: While the Aurora stands, the city lives. After the Siege of Leningrad was lifted, the city began building the Nakhimov Naval School, designed to educate young boys and youths – the children of the sailors who had perished during the war. However, more space was needed to house the children. It was then decided to moor the Aurora eternally by the waterfront in front of the Nakhimov Naval School building, where it could be used by the institution to accommodate its cadets. When the Nakhimov cadets were decisively moved ashore, the cruiser was transformed into a museum. Since then, the Aurora has been open to tourists: Anyone who wishes can go onto the deck of the ship, look into the sleeping compartments and see the cannon that fired the blank shot. When will they bring the Aurora back? According to the Russian Defense Ministry, the cruiser will be returned to its former location in the summer of 2015, in time for the centenary of the October Revolution in 2017. Its exterior will be preserved, but the exhibits in the ship's museum will change. Museum employees say that it will now be dedicated to the evolution of shipbuilding and the Russian fleet, rather than the revolutionary events of 1917. Today the St. Petersburg charter contains three official city symbols: the Bronze Horseman, the little ship on the spire of the Admiralty building and the angel on the spire of the Peter and Paul Cathedral. Two years ago, St. Petersburg deputies proposed adding a fourth landmark: the cruiser Aurora. However, the public was skeptical about the idea. 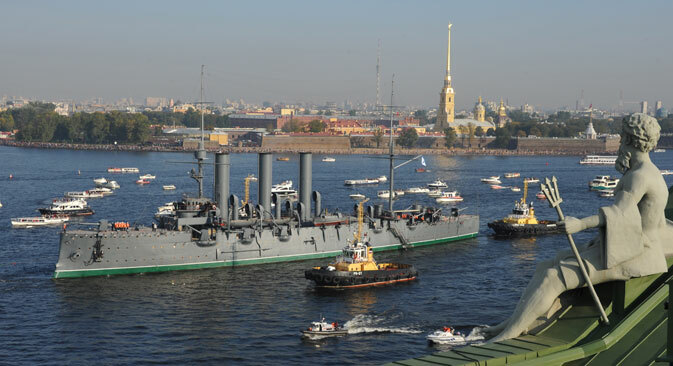 According to Igor Kudrin, however, this is unimportant: "The cruiser Aurora was and will always be the symbol of St. Petersburg, even without all their papers," he says. The city's enduring love for the Aurora was demonstrated at the recent send-off for the ship's maintenance. As the cruiser was being towed towards the shipyard, thousands of St. Petersburg residents lined the embankments of the Neva to see it off. Some even shouted: "Aurora, come back soon!"